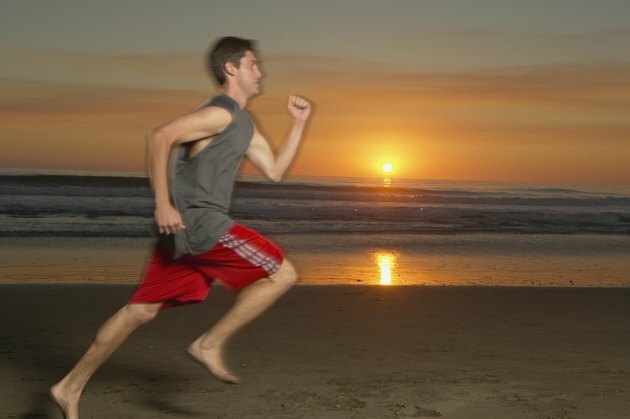 Running is an efficient way to burn calories because it engages the body's aerobic energy system. Running helps burn calories from fat and glycogen -- where your body stores carbohydrates. Depending on how many calories you eat each day, you can start to take off pounds with running within a week. You will need to burn 3,500 calories for each pound of weight you want to lose. If you burn 3,500 calories during the week through running, but eat an extra 3,500 calories during that same period, you won't lose weight. Think of this formula as burning 500 calories more than you eat each day to lose one pound of weight each week. You can create your calorie deficit by reducing how many calories you eat each day by 500, burning 500 calories through running each day or by combining calorie reduction and running. To lose 15 pounds of weight, you'll need to burn 52,500 calories more than you eat. You should aim for one to two pounds of healthy weight loss each week, recommends the National Institutes of Health. If you want to lose 15 pounds in eight weeks -- roughly two pounds per week -- you will need to burn approximately 940 calories per day more than you eat during those eight weeks. Harvard University publishes a calorie-burning chart through its Harvard Health Publications website. This chart shows the estimated number of calories you burn during 30 minutes of exercise. Running at 5 mph burns 240 calories per 30 minutes in a 125-pound person, 298 calories in a 155-pound person and 355 calories in a 185-pound person. This means, a 155-pound person will need to log 88 hours of running, at 5 mph, to eventually lose 15 pounds -- assuming the daily caloric intake doesn't change. If you calculate your calorie burning numbers in an attempt to determine the exact number of weeks or months it will take you to lose 15 pounds through running, plan on your weight loss taking a little longer. Your body may react to your weight loss by slowing your metabolism somewhat. You may find that you don't run every day due to the weather, changes in your schedule or soreness from the previous day. Your weight loss may also take longer if you miss your daily caloric intake goal.